In a small bowl, mix cracker crumbs and sugar. Stir in butter. Press onto the bottom and up the sides of an ungreased 9" pie plate. Bake at 375° for 6-8 minutes or until lightly browned. Cool completely. In a medium saucepan whisk together the milk, sugar, cornstarch, and egg. Cook over medium heat, whisking constantly, until it comes to a boil and thickens. Remove from heat and add the vanilla and the butter. Pour the custard through a strainer, then pour the custard into the cooled pie crust. Place some plastic wrap directly on the custard while it is still hot and refrigerate until completely chilled, at least three hours. Mix the peaches with the sugar and cinnamon in a large bowl and let stand for ten minutes. In a large skillet melt the butter over medium heat. Pour the peaches into the skillet and cook, stirring constantly, until the peaches are soft. In a separate bowl combine the cornstarch and water. Bring the peach mixture to a boil and add the cornstarch. Cook until thickened. Turn off the heat and allow to cool approximately ten minutes. Using a slotted spoon to drain off any excess juices, top the custard layer with the peaches. Chill the pie for one hour. In the bowl of a standing mixer add the cream, powdered sugar, and vanilla. Whip on medium-high speed until stiff peaks form. 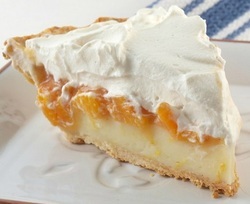 Spread over peaches and return to the refrigerator at least one hour before serving time.